Gold Aura Quartz increases self-worth and personal power by raising ones vibrations to empowerment and joy. It can bring abundance to ones life through positive thoughts and actions, and bring clarity and mental focus. Gold Aura Quartz allows one to be compassionate and open to receive and give love on all levels. 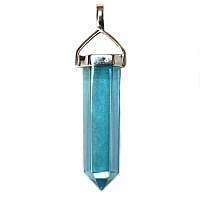 Some say that Golden Aura Quartz will help you find lost items. It is also being used for building character, stimulates one for the exploration of the unknown. 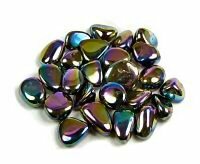 It is said that Golden Aura Quartz will help promote determination in performing tasks. This golden aura quartz provides a person with power to lead projects, organizations, and efforts to success. They can give authority, control, leadership, success, and influence. 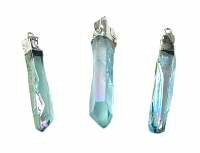 Golden Aura Quartz crystals is perfect for personal talismans. Keep this quartz near where you spend time at home. Keep it close where you can see it and absorb its energy into your life daily. 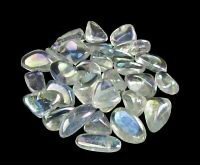 Golden Aura Quartz is a clear Quartz crystal that is treated with energy-enhancing coating. 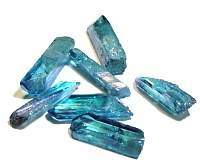 Like the Angel Aura and Aqua Aura crystals have been treated to a special process in which they are placed in a sealed chamber, while being heated and electrified, and are exposed to various metals. Some of the metals are titanium, copper and iron. The results are a beautiful golden energy. Golden Aura Quartz has a golden orange based color and beautiful iridescent flashes. Metaphysical healing lore says that Golden Aura Quartz assists with the Digestive System and Metabolism.